energies from new moon to new moon. 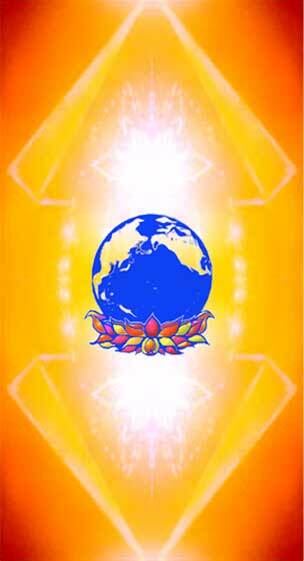 events in the lighted, loving energies of Divinity. love and will. Make sure to mark your calendar! silent meditation from wherever you are. May 19, 2019, Washington, D.C.
the inner planes for these free seminar events. in our free free monthly online newsletter. receiving from the Heavenly Realms. is included in this healing matrix and meditation. and dedicated Earth Treasure Vases will be shared. See Earth Treasure Vase Global Healing Project. Rev. Brzezinski leads the prayer/meditation. Register for the monthly Prayer Call info. reaching out for prayer and community. The energy on the call is always palpable. in the gathering of our intentions. "Power of Prayer" in the subject line. and the power of love within each individual." life is interconnected and interdependent. begins with self acceptance and forgiveness. celebrated annually since May 1, 2004. Spread the word. Simply be love! magnificent planetary web of light! tune in or receive the recording. the collective unfolding of our nation. the collective body also heal these issues. up" in our national psyche. Ready for a media cleanse? in a meditation each month on the 19th day. and available to you on the webcast replay. Registration gives access to the 2019 Soul Songs. Listen or watch the October 24 replays. with the Divine, each other and all of Life. "Living Your Life for the Benefit of All." and remembrance of Who We Really Are! Read the Declaration in several languages. Sign the Global Oneness Declaration. The link lists numerous ways to make free calls. meditative vision for creating a new world. of the forces of light. and new moons via GoToWebinar. an Easter 2018 global meditation. remains posted here because of its potency. can be of great benefit. Simply 'receive'. transmit grace and comfort out to the world. Energies are transmitted and received from this grid. Video provides background about the grid of grace. Visit and join in anytime. of conscious breathing unites humanity. to assist the ascension of planetary vibrations. service to a peaceful outcome for Syria. from his recent remarkable vigil-trip. success of the Syrian peace process. about 14:24 minutes into the recording. are shared by individual participants. exciting new wave of possibility on our planet. about 25 minutes into the 1-hour recoding. Note: Link is mislabelled Sister Jenna. Join with people all over the world. or on your web page. and link to networks, groups, individuals. "That which you believe is true must be stated." at a special / sacred site. Suggestions for gatherings are included. as a vehicle for global transformation and healing. Chanting Circle. See list of existing circles. to connect with all people through sacred love. Learn two simple ways to create a Circle of Love. find a quiet place, and pray. free of charge, 24-hours a day, 365 days a year. Write, email or call toll free: 1-800-NOW-PRAY. for people of all faiths for over 100 years. goodness in all. Hallow planet Earth. committed to this active global meditation. to the field. You can be in your own space. connect in harmony with the whole world in your heart. that others have begun to join you. the world in sync with one another. Tell a friend! Pass it on! invited to join this worldwide global movement. wave of prayer washing over the mideast every hour. peace and healing in the Middle East. Your participation is most welcome. Middle East Crisis ~ What Can We Do? pyramid which was first meant for Old Jerusalem. inspiring idea that could be realized in every city. 5-7 days a week commitment. Create peace by being Peace. assisting those in need around the world. significance of meditating at the quarters of the clock. with the site's posted event. now occur monthly in over 380 cities worldwide. Start one in your city. to speed up the process of Ascension. also with grouping at the thought plane. number of united and organized intelligences." from the "Existence of God is Self-Evident"
by Grand Master Choa Kok Sui. Meditation is available 24 hours 7 days a week. Audio Full Moon meditations are also offered. Participate as an individual or in a group. heal ourselves and the planet. Lift the consciousness of every being. Guided audio meditation is included. positive feelings to your surroundings. over 90 countries around the world. peace, love and care to our world. Sunday closeset to Aug. 15th at the same time. medics and healthcare workers also participate. intention is to bring forth the Highest Good. hundreds of participants from all over the world. Singing Love, Speaking Love, Praying Love. recording - available for one month. the urgent problems facing humanity. NZDT begins last Sunday Sept. UT+13hrs. NZST begins first Sunday April UT+12hrs. that circumvent the planet and cross America. help to the earth and all of her inhabitants. for the Reappearance of the Christ. that can better effect change in our world. and helps reveal peace where it is hidden. bridges time, space, miracles, and belief. directly effect us and the planet. active, due to the director's retirement.